We can measure the runtime and check the performance of the program by using the transaction SE30. 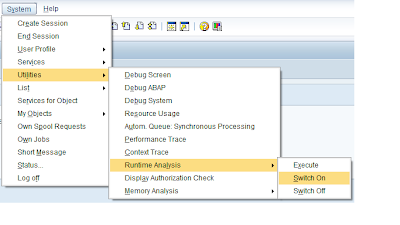 SAP Help on the Runtime Analysis using SE30. Today we will elaborate the option to measure the performance of the specific part of the code using the SE30. This option would be helpful when we want to measure the performance of particular subroutine, FM, Select query etc. We have the option to start the runtime analysis and stop it on the fly by options System > Utilities > Runtime Analysis > Switch On and Switch Off. For demo, we will set two breakpoints: one before starting the FM and one after FM. When we reach at the breakpoint and we try to start the performance measurement by option Utilities > Runtime Analysis > Switch On, system would give the message as “The Particular units” option is not selected. This message appears because the DEFAULT variant doesn’t have this option selected. You can see this variant in SE30. Enter the DEFAULT and press the “Display” button. So, we need to select the option “Particular Units” in the measurement variant. To do this, we will copy this standard measurement variant to user specific variant and then select the option “Particular Units”. 2) Select this newly copied variant. Here we need to select User Defined variant. 7) After finishing the entire transaction, press the evaluate button to evaluate the performance of required code lines. Runtime performance can be switched ON by enter /RON in the transaction box when it reaches to the desired breakpoint. Same way /ROFF could be used to switch off the performance measurement. Inspite of a copy of the variant and selecting the Particular Options checkbox in the copied variant, it still says the option is not selected when i run the program through SE30 with the copied variant. i will make this steps and after i set breakpoints it is not set in the report why ?? and i don't understand this description lesson i am very sorry but i like to ur blogspot . "…copied variant, it still says the option is not selected…." Here you need to select the user specific variant as shown in the Step 4. Please let me know, if you still face the problem. "i will make this steps and after i set breakpoints it is not set in the report why ?? … "
Did you save these breakpoints as the session breakpoints? i wan't ur mail (hotmail or yahoo or gmail) please to ask u something about my work if i can i was add u in gamil messenger wait ur mail and thank you . Great post. I also really enjoyed your post on field symbols as well. I’ve found se30 to be a great tool — my only complaint about it is that the graph that accompanies it is often misleading. After reducing the amount of memory, it’s easy to think “Oh-no I’m pinging the DB too much” just by looking at the graph where if you compared your adjustment numerically you may find a slight decrease in access time to the DB. thanks for the post. But to turn on the run time analysis it works only with classic debugger not with new debugger. do you also have the same problem or you can work with new debugger. when i tried in new debugger it still says ‘Particular Units’ not turned on. does this only works with old debugger or am i missing some thing. /RON and /ROFF should definitely work in new debugger as well Check this out: Measuring Selected Coding Extracts and New ABAP Debugger – Tips and Tricks.